Without buying a dedicated BBQ smoker you can easily turn you charcoal or gas grill into a smoker grill. Charcoal and gas on their own don't add much flavor to the food your grilling so we use wood chips, chunks or pellets to add the smokey flavor. Smoking woods really add another dimension to the flavor of your food, giving it a more authentic, old-fashioned smoker grill flavor. Another convenient option are the compressed wood smoking pellets. 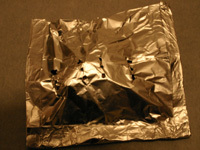 These work very well tossed on the hot coals or used in a cast iron smoking box or foil smoking pouch on a gas grill. I enjoy the Jack Daniels pellets quite a bit as the smoke has a nice mild flavor - nice with BBQ pork. Most of the smoking woods you'll buy and use are hardwoods, typically from fruit or nut trees. Fruit woods like apple give a lighter, sweeter flavored smoke and really work best with chicken or pork. Other woods like oak and hickory give a much stronger smoke flavor and can be used with most meats. Hickory is one of the most popular but a little goes a very long way. Also available are flavor infused pellets made from compressed sawdust, shown on the left. A handful of the Jack Daniels pellets added when the meat goes on the grill gives a fantastic flavor. You may also be able to find Whiskey or Wine barrel chunks - if you do, get them. They add a very subtle charcoal smoker flavor as they smoke and the years of wine or whiskey aroma is released. Alder Very light, delicate sweet flavor. Similar look and feel to Cedar Great for lighter foods like fish. Also works well with pork and poultry. Apple Slightly denser than Alder but still a fruity sweet smoke Nice complement to poultry and pork. Depending on rub or marinade a nice change to pork ribs or ham. This combines well with other woods like Cherry. Cherry Similar sweet fruity taste like Apple Also works well with poultry and game hens, pork and jerked meats. Hickory The classic smoking wood. Unmistakeable presence with it's strong old-fashioned flavor. Too much can overpower the food though. Great on the smoker grill with most meats but I find works best with Beef. Try it if you're smoking cheese as it gives a bacony flavor. Then use that cheese stuffed in pork rib chop recipe like this. Another good wood that can be blended with other wood smokes, like Oak. Maple Subtle sweet smoke flavor Goes very well with Pork. Mesquite Familiar Tex-Mex smoke odor and flavor. Strong unmistakeable taste. Great when doing beef or chicken on your smoker grill. I wouldn't use this on fish. Oak Nice balanced smokey flavor - goes very well with other woods as a blend like Cherry or Apple - even tones down Hickory Suitable for all types of meats. Pecan Sweet flavor with a hint of nuts. If you're doing one of the asian inspired recipes try this wood. Also great with Chicken and Pork. Whiskey/Wine Barrel wood chunks Depending on your location you may be able to find these. When these barrels reach the end of life they're occasionally cut into chunks for smoking woods. Subtle flavors based on the type of barrel wood you're using. Wine based chunks can enhance beef, particularly if combined with rosemary distributed across the hot coals. Experiment and have fun. 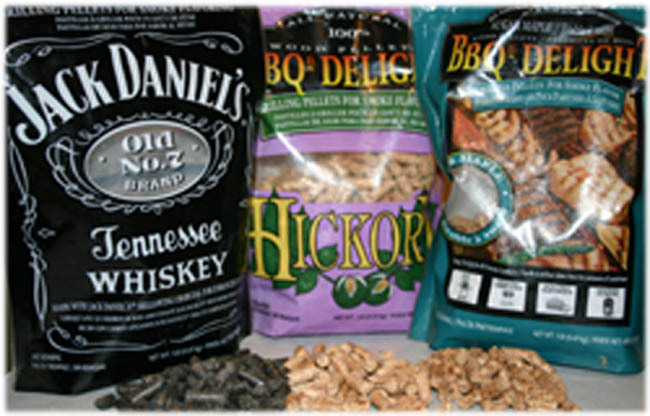 Flavored Pellets Available at most big-box hardware or BBQ shops. Many flavors to choose from including the familiar smoking woods. Try the Jack Daniels - nice subtle flavor but definitely a flavor. Use on different foods as you wood regular chips or chunks. Soak wood chips and chunks for at least an hour in enough water to cover them. For added flavor I also use different liquids like apple ciders, bourbon, beer or wine. Even with soaking the chips there's actually very little penetration of the liquid into the wood - cut one open after a few hours and you'll see it may have only soaked in an 1/8". Regardless, even this little amount of liquid helps prevent the chips or chunks from burning too quickly when tossed on the hot coals and smoking longer. Consider a blend of wood chips for even more unique flavors on your smoker grill. How about a Texas blend of hickory, mesquite and oak for smoking beef? Apple and Cherry work well together when doing BBQ Chicken recipes like this Jerk Chicken. If you can find Pecan it mixes well with Oak and Hickory to smooth out the strong flavor of the Hickory, use equal parts of the three together. To use your charcoal grill as a smoker grill you'll need to use the indirect grilling method described here. After you've got the charcoal to the proper temperature and you're foods on the grill ready to cook, toss a handful of soaked chips on each pile of hot coals. They'll begin to smoke right a way. Close the lid and adjust the top and bottom vents to get your temperature just right. The smoke will immediately begin to infuse the fresh uncooked food. Once meat begins to crisp up on the outside (called bark) smoke flavor has a harder time getting into the meat. For longer burns throw another handful of soaked chips or chunks on the grill every-time you replenish the coals. 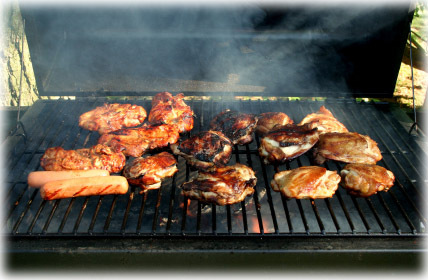 Traditionally, gas grills weren't as effective as smoker grills as charcoal grills. To get the grill hot enough to smoke the wood meant you'd likely be running it too hot for long term indirect cooking. 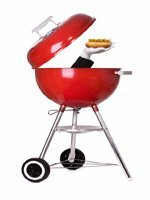 There are now several options available that make gas grill smoking possible. 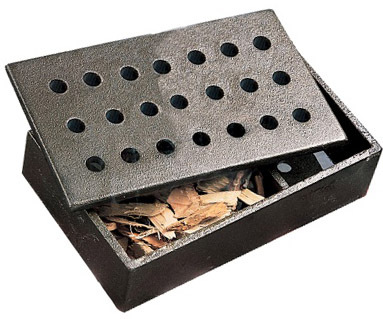 Some gas models today offer dedicated burner and smoking boxes that you slide out and fill with smoking chips. Other options are smoking wood trays over the rear infrared burner, fill this with chips and the heat from the burner gets them smoking. Ideally, either option is out of the way from the center of the grill where the food is during indirect grilling. OK, you've a gas grill but neither of these smoking tray options and you want a smoker grill. Basically two options, a small cast iron smoking box shown here - this one is a Weber and really works well. 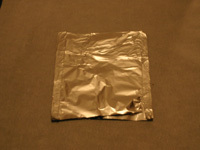 Another option is to make whats called a smoking pouch from aluminum foil. 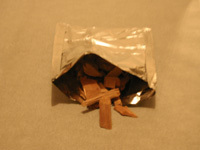 Making a smoking pouch is very easy and you can use both wood chips or pellets or a combination of both. When using smoking pouches you have to add them to pre-heated high temperature gas grill when you start the cooking session. That's the only time the grill will be hot enough to get the chips smoking. For longer indirect cooking times you can't be adding more smoking pouches every hour - at lower heat, that's just not going to accomplsh anything. Basically the first hour of smoking in a gas grill is when you're going to be producing smoke. 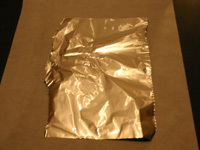 Lay a small sheet of aluminum foil on your working surface. 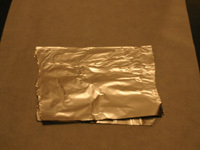 Fold the edges over several times to make a pocket. Fold the open edge over several times to close the pouch and poke several holes in one side with a fork for the smoke to escape. Place the sealed smoking pouch on the burner. When it begins smoking place your food on the grill.